A half marathon who's start line was less than 2 miles from my house? Yes please! Back in March, I was marathon training with 17 miles in the books for that day. The North London Half seemed to be a perfect solution. All I had to do to get my miles in was run to/from the course with a bit extra on the way home to hit my target. Plus I could sleep a bit later as there wasn't too far to travel to get to the start. Registration process & fees: Registration was online but as I received a media place, I am unsure of how much it cost. For my media spot, it was very confusing to get id bracket in one spot, drop bag on completely other side of stadium (across security and the track), and the start line was a far bit from the stadium. All these factors meant I left my bag in the regular bag check and run to the start in the hopes that I didn't miss my start pen. There didn't seem to be good communication of information between security, staff, and organizers when I had questions on where things were. The layout of the stadium played a large factor in this I think. 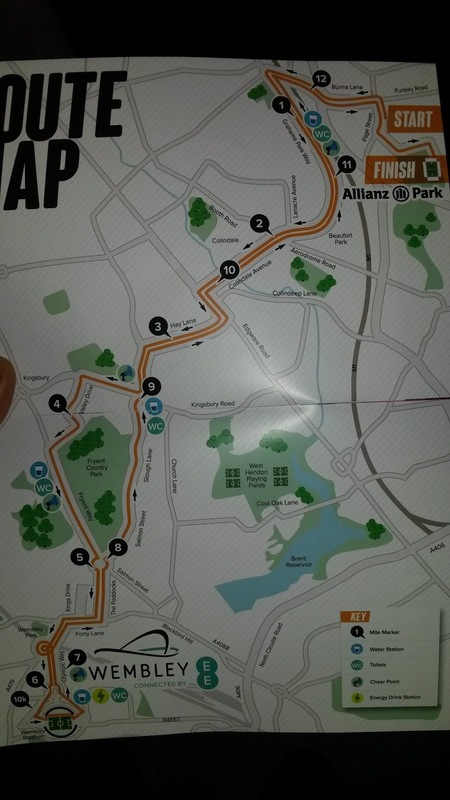 Location: The start line was a bit up the road from Saracens Allianz Park in Mill Hill (NW4) with bag drop and the finish line in the park behind the stands. 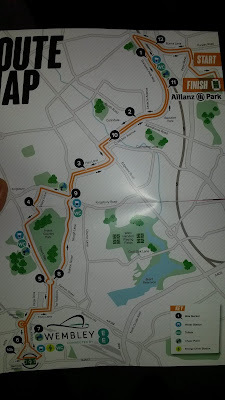 Allianz was hard to access via public transport if you didn't know the area, although they did have shuttle buses running from Mill Hill East station. I was a local and was quite happy with the location. 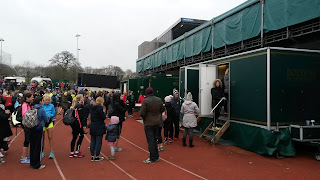 Course & bogs: The stadium had limited toilets available for women and everything was spread out around track with different sponsor stands, food trucks, and loos. The queue to pick up my bag after the race was terrible (I think I was in one line for 2 sections as it made no sense why the line was so long). I ended up eating all the food in my goodie bag (chocolate bar and chips) while I waited for at least 20 min in the cold rain. 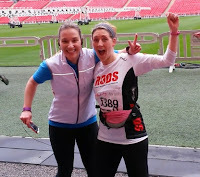 Along the course, I was lucky enough to be paced by Lenka (check out her blog, Runista) and it was great having a chance to catch up with her. The course was essentially flat for a while, but then had some unexpected hills (right after I commented on how flat it was to Lenka). It was cool to run by some sights in my neighbourhood, like the RAF Museum. Running inside Wembley was pretty awesome. I stopped to get a photo with Lenka and rumour has it we made it up on the Jumbotron. Wembley Stadium was the turnaround point, so you felt pretty good when you started seeing familiar landmarks on the way back. James and Oldland walked down to see me near the finish at mile 11. I even got O to run with me for a very short distance and got a cheeky pro shot with him (but I won't share in case of copyright issues). However, this wave of excitement drained the last bit out of me and I couldn't kick at the end for a strong finish. 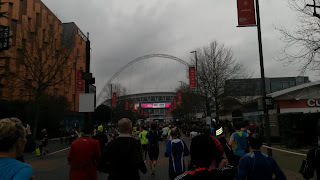 Atmosphere: The cold rainy weather wasn't the best (kinda spitting but not too windy), but people were excited to see Mo Farah blow the starting horn so the start pens were buzzing. After the race, people were excited to have their medals but the cold rainy weather meant people quickly departed. Bling/goody bags: Everyone got a medal and a black tech t-shirt at the end. 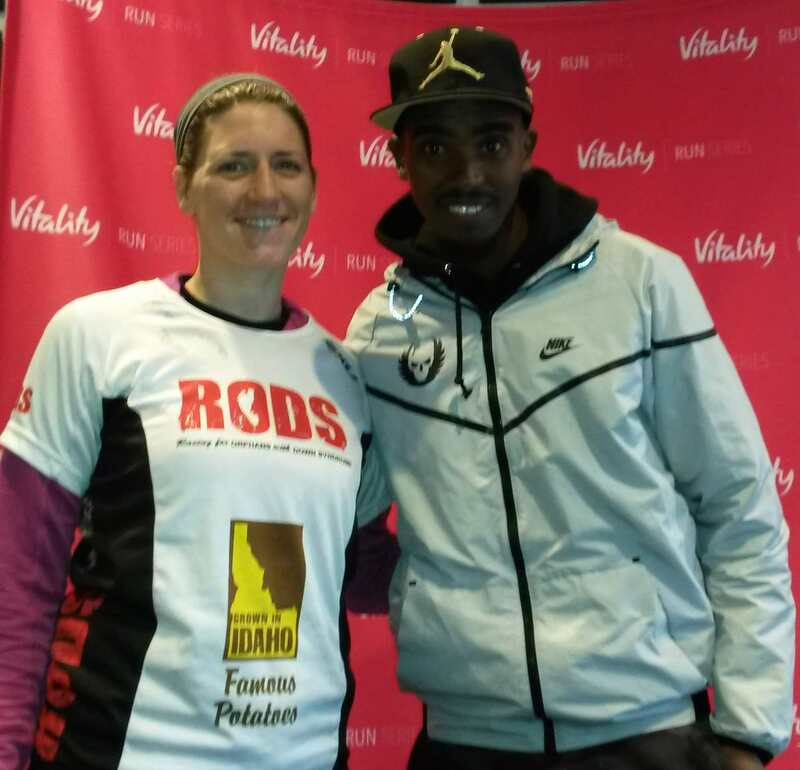 My friend and former client, Kiera, volunteered to hand out medals to the finishers. It was lovely to see a familiar face at the end of a tiresome 2 hours. 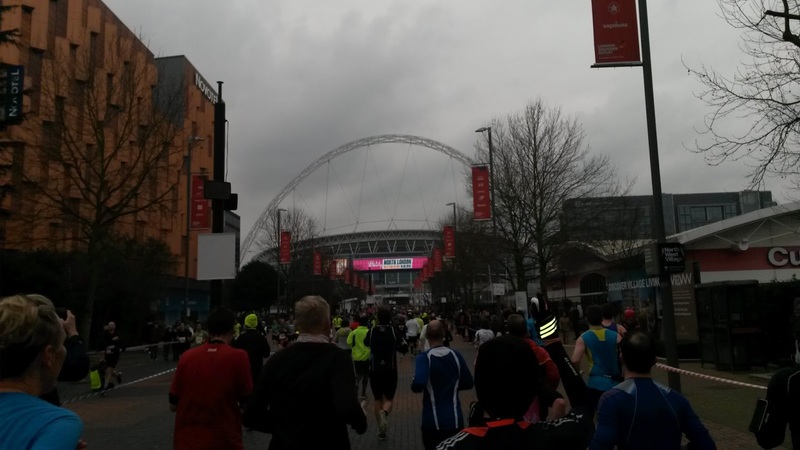 Tips if you decide to take part next time: My feedback would have been about setting aside lots of time to get to the start line, There must have been a lot of feedback about location though as they have switched the route this year to start and end in Wembley Stadium. 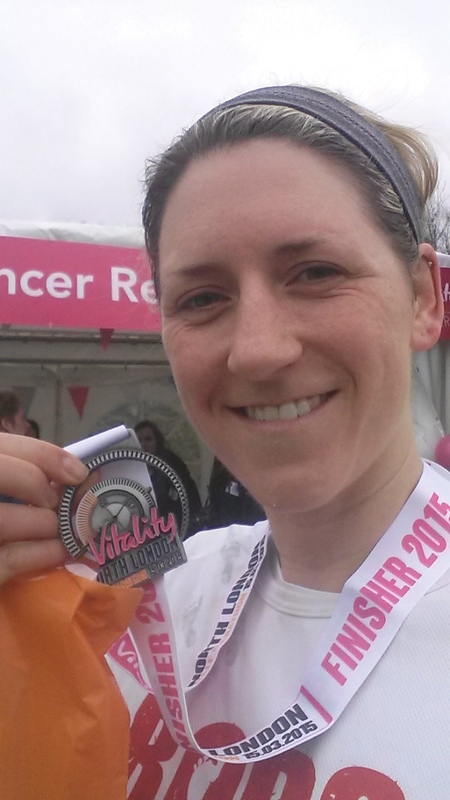 Want to sign up for the race on 20th March, 2016? Registration is on offer for only £35 until 2nd November, so sign up now to take part in next year's race. 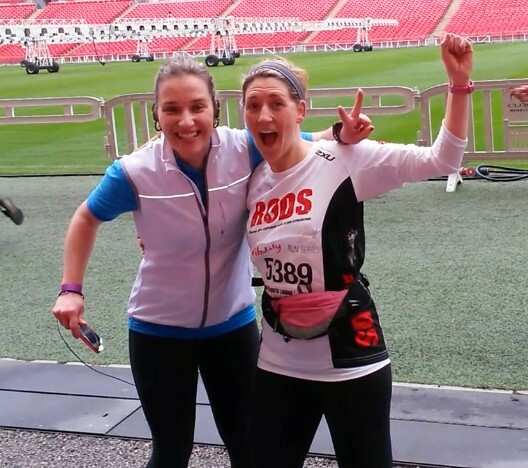 For 2016, all runners will receive a free finishers technical t-shirt from race partner, Brooks, a fantastic medal, premium goody bag and post-race massage on race day. Thank you to Vitality North London for the complimentary race entry and the opportunity to have a photo snapped with Mo Farah. All opinions are honest and my own. Sounds like the event will go from strength to strength - feedback is so helpful to improve. Yes, I think it will be a great route in 2016. Are you going to enter?